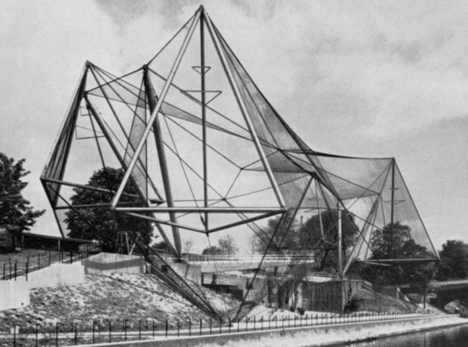 in her lecture last week on cedric price’s aviary, hadas steiner mentioned in passing the relation with the work of german-architect-turned-venezuelan-artist gego. comparing both works more closely, i’m interested in the autonomy of the aviary as an object: price described it as a spring, and indeed we sense snapping any member will dissolve the contained tension and everything will collapse. yet the work is designed to be inhabited, by birds, plants, and humans. in contrast, gego’s reticularea depends very much on the room it invades, but we are meant to walk around it, not inside it, not only in terms of its scale, but because we sense it is so delicate that it might quiver at the slightest touch. and what might the museum guards say then? 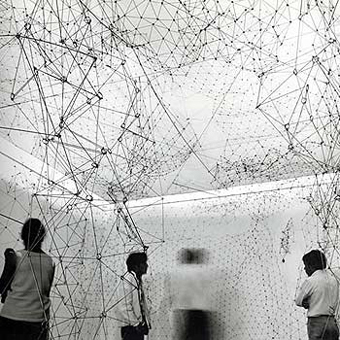 personally, gego’s work reminds me more of hungarian architect yona friedman’s spatial city drawings. friedman, by the way, still alive [see here for a recent interview!] was an influence to price: both argued they were more focused on process than on objects. friedman’s spatial city meant to provide a framework for individual participation in building their own environment. in a way, this project has qualities of both price and gego- it is inhabited like the aviary but not autonomous, it depends on its surroundings for support like the reticularea but has a degree of intended rigidity that can stand for objects to populate it, hang on to it, inhabit it.